Sydney Theatre Company and Medina Apartment Hotels present BRINK PRODUCTIONS’: WHEN THE RAIN STOPS FALLING by Andrew Bovell a collaboration with Hossein Valamanesh and Brink Productions. This is an outstanding theatrical experience. All the theatrical elements have been so entwined that every moment on stage looks as if it is meant to be there. It looks and feels like refinements of choice have gone on. There is no ‘accident’ on stage. All looks considered and thought through and has the air of absolute spontaneity. The work is powerfully integrated by all the artists in the production. It is gripping, mysterious, intriguing, magical, moving and complete. To quote the writer from the program, “This is a play about human resilience and our need to understand the past in order to go on.... It moves across time, back and forth between London and Australia, between 1959 and 2039 as the stories and secrets of four generations of one family are played out.” It mostly concerns Gabriel Law and Gabrielle York and their extended families. It is written by Andrew Bovell in interchangeable time spaces and worlds; the writing demands your attention. On the night I attended the audience was held from the first marvellous monologue delivered by Neil Pigot, as the first of the Gabriel Yorks’, and even in Sydney at the beginning of it’s coughing season (winter), barely a sound, other than that of palpable concentration and identification was heard for an uninterrupted two and a quarter hours. Laughter was warm and full of pleasure. Tears and shock and discovered connections to the jigsaw puzzle of the play were spread about the auditorium, collectively, by a delighted audience (Did we feel clever or not?) – deep satisfaction was recorded by the applause at the end of the performance and impassioned discussion went on outside as we moved to our transport, home. Brink Productions based in Adelaide under the Artistic Direction of Chris Drummond states in the program “BRINK creates powerfully imaginative theatre through long-term collaborations with artists and non-artists from different backgrounds.” This project was begun in 2004 with Chris Drummond, Andrew Bovell, Hossein Valamanesh, and Quentin Grant under the title THE EXTINCTION PROJECT. 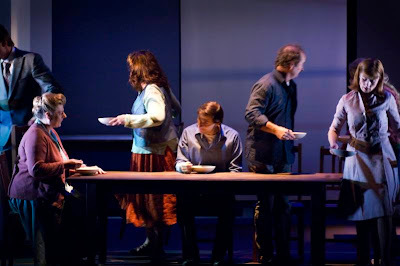 Over the next three and a half years through several stages of development the work evolved into WHEN THE RAIN STOPS FALLING and premiered at the 2008 Adelaide Festival. The first visual images of a beautifully choreographed movement of figures through a three layered scenic solution (Hossein Valamanesh), that is almost dreamscape in effect, accompanied by a live piano score (later augmented more complexly with other instruments and recorded sound and music), (Quentin Grant) gently attracts our attention. Flown design elements and shifting furniture supported with Video Designed images (TheimaGen) and the most seductive and sensitive lighting (Niklas Pajanti) keep arresting our aesthetic curiosity and maintains our focus breathlessly. The writing full of re-iteration and thematic clarity supported by powerful choreographic imagery by the director is hypnotic in the mysterious and yet familiar outflow of its storytelling. Powerful obvious truths and disturbing predictions of possible, disturbing, future world changes are delicately scattered before our attention and they seep without drama into the psychic absorption and acceptance, recognition of the audience. There is no struggle with the world view that Mr Bovell gives us. (Fish falling from the sky in Alice Springs, for instance.) This playwrighting more than justifies the great excitement of anticipation that Mr Bovell heralded with his early work SPEAKING IN TONGUES. The beauty and power and integrity of this work from every artist is testament of an organisation like BRINK that have found a way to subsidise long gestation periods for their work. The Government and its Funding bodies should take note of what can be achieved with long-sight and proper planning and development opportunity. In the back of the program Brink states, "Brink has a range of new work in various stages of development including a multi-narrative ensemble work for African and Australian actors and musicians, a devised work with one of Australia’s leading physical theatre companies and a major international collaboration with a London-based theatre company." Let us hope that they are allowed to ripen. In my mind, these productions : John Bell’s THE LEGEND OF KING O’MALLEY, Rodney Fisher’s THE MAN FROM MUKINUPIN, Neil Armfield’s CLOUD STREET, were inspirational and unforgettable Australian dramatic work. WHEN THE RAIN STOPS FALLING is in that list of treasured memories. Playing now until 20 June. Book online or call 02 9250 9777. Just a correction - "Speaking in Tongues" was not Bovell's first play (among other things, he'd written "Ship of Fools" and "After Dinner" well before it). I completely agree with all aspects of this review. 'When the Rain Stops Falling' is quite simply, in one word, superb. All the elements of this production gloriously and deliciously came together in perfect harmony; the writing, the music, the performances, the set, the lighting, the direction. Any play that is going to run for 2.5 hours without an interval is generally asking a bit much of its audience. However, this production was so captivating that it flashed by in no time at all. I was completely there, along for the ride in every instance.